If a big event occurs in current events, I check out Nibbo.com to see “what’s trending.” I expect to see the major headlines show up, so I checked today, but found Nelson Mandela didn’t show up in the top twenty Google searches (maybe he did yesterday) I was surprised by the trends, in the U.S., for Google searches: the top twenty were very heavy on shopping. The number one search is for the World Cup Draw, but other top searches included Amazon, Toys R Us, Macys, Michaels, Old Navy and Sears. The Twitter Trends on Nibbo were dominated by, apparently, the World Cup Draw, so I visited TrendsMap and found that Mandela is, thankfully, still part of a global conversation. Perhaps you’ll want to go to the movie, Mandela: Long Walk to Freedom, in theaters now, and discuss the film on Facebook or with your students.If you’re a blogger or Tweeter, I recommend joining the conversation today on the life of Nelson Mandela, or on the World Cup (or on holiday shopping craziness?). Please add links to your blog posts in the comments below so we can share your posts on Facebook and on Twitter. 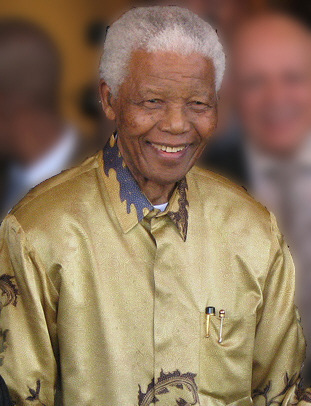 The photo of Mandela is attributed to South Africa: The Good News.